What is Aspire Atlantis Sub Ohm Tank? We recommend using it with the sub ohm batteries like Aspire Sub Ohm, eLeaf iStick etc. If you do not know which battery to use - please ask us or learn about batteries before using the Atlantis tank. Using the Aspire Atlantis will significantly increase your eLiquid consumption - there is no magic folks - bigger cloud requires more eLiquid. The Aspire Atlantis is a new sub ohm coil design with adjustable airflow. The Atlantis Aspire Tank has coils from 0.5 - 0.7 ohms so you can run high VG eliquid through your coil tank system. The Aspire Atlantis tank system runs like an RTA with a sub ohm coil and great airflow with an adjustable airflow ring at the bottom of the tank. The Aspire Atlantis sub ohm coil tank comes with a glass tank, drip tip, and a nice package. The Aspire Atlantis tank is a standard 510 atomizer connection, and provides excellent connection and superior durability. The Aspire Atlantis can now run from 20-30 watts and comes with a 2ml eliquid fill capacity. 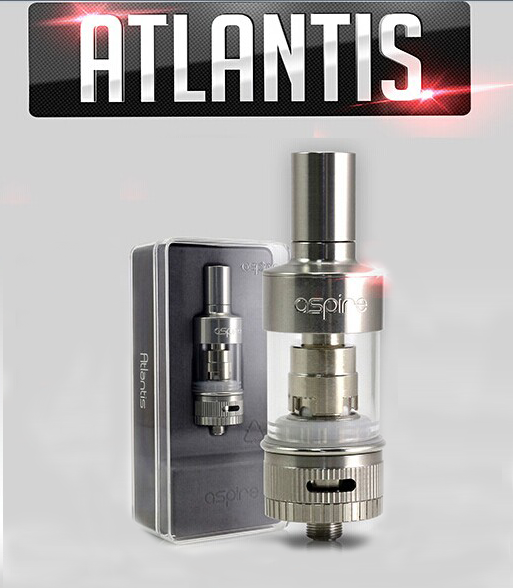 Please note the Aspire Atlantis Coils will not fit the existing Nautilus tanks. If you have been looking for great vapor production on a tank system, the Aspire Atlantis atty is the best on the market and will change the way you vape on a coil tank system. If you are ready to get the newest BVC coil tank that performs like a sub ohm tank, then you need to add one of these to your collection! The Aspire Atlantis is from the same vein as the Aspire Nautilus (the best glassomizer of 2014), its build quality and overall finish is of course excellent. To fully appreciate the Aspire Atlantis, it is important to understand that the Aspire Atlantis is made to be the perfect complement to the already hugely popular Aspire Nautilus. The Aspire Atlantis in no way replaces the Aspire Nautilus - these two tanks serves two very different purposes. The Aspire Atlantis is targeted at folks looking for big clouds of vapor - it is perfect for someone interested in "sub ohming" and who values his/her time (no need to waste time rebuilding coils). The Aspire Nautilus instead is perfect for everyone else really - it has a bigger tank capacity - it produces great flavor while keeping the eLiquid consumption low. As you may know already, most vaping products are being copied nowadays, these "clones" have become a major issue for the industry and they can be found everywhere in Australia. We have tested many competing websites in Australia and USA and many of them are selling Kanger and Aspire clones without telling their customers - this gives them an unfair competing advantage and is deceitful to their customers. Thankfully Aspire, Kanger and others have put in place a security authenticity code on their products to prevent counterfeiting. diKudi strongly support this initiative and we hope that all manufacturers will implement a similar mechanism moving forward. diKudi customers can be assured that if we ever sell a clone product it will be clearly labelled as such in the product name and its description.